It's not often you hear a chef use the word "spiritual" when describing his new restaurant, but Scott Pickett did just that when talking about opening the doors on his third venue, Estelle by Scott Pickett (ESP). "I'm where I want to be in my life, it's almost spiritual," says the chef, who, after a handful of soft openings to family and friends, opens to the public on Friday. Pickett is aiming high with ESP. The 50-seat dining room, next door to Pickett's Estelle Bistro, is contemporary and textured in fitout with lots of black marble, concrete wall tiles and black steel shelving. Philippe Starck​ chairs, hand-made tables by local craftsman Ben Sibley​, and a striking central light fixture by artist and designer Christopher Boots, give a maturity and global sensibility to the room. Detail is everywhere: the signature "E" stitched on linen napkins and carved onto the handles of the Laguiole knives by D'Albrac​ on each setting. It's also pressed into the hand-made leather bill folders designed by Pickett's front-of-house manager Stuart Neil. The open kitchen adds its own element of theatre, with seats available overlooking the chefs in action. The seven-course degustation-only menu is $130 a head and may include a dish of kingfish, ink and burnt carrot or White Rocks veal, nettles and hand-rolled macaroni. The wine list, compiled by sommelier James Dossan​, most recently at St Kilda's Luxembourg, is an intelligent mix of local and imported drops. Dossan has created two optional wine matchings, a Premier at $90 or Grand at $120 a head. 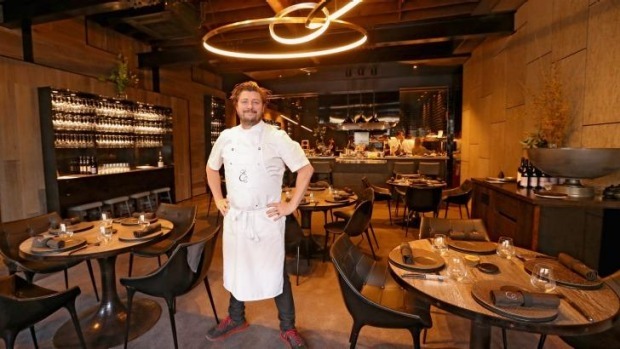 "People have said you don't see restaurants like this in Northcote, but I said, 'it's Melbourne, you can open something like this anywhere'," Pickett says. Sounds like he's in a good place. Open Tuesday to Saturday from 6pm and for lunch on Friday.